Across the country, our urban areas are booming. Roads and bridges are being repaired. Transit lines are being extended. New stadiums and event centers are being built. Luxury condos and shopping centers seem to be sprouting up on every street corner. In just a few short years, neighborhoods will be completely transformed. Unfortunately, development and increasing wealth in our cities often fails to reach those who need it the most. As inequality continues to rise in our cities, for those at the bottom new development can mean skyrocketing and unaffordable rents and exclusion from new jobs rather than access and opportunity. As our cities grow and change, we must make sure that traditionally underserved communities are not left out of the benefits of major projects., but instead get access to the good jobs they need. In light of the growing challenge of making development work for all city residents, communities and elected officials around the country have advocated for “local hire” policies and agreements. These measures, which are sometimes part of a broader set of community benefits, ensure that public investment in economic development has a positive impact on those who need it the most. It works like this: as cities and developers invest in major projects, a percentage of the jobs created are reserved for a defined group of people. Local hire policies reserve jobs for individuals that reside in a particular geographic area. Policies can focus on a variety of geographies including cities, counties, and school districts for example. Ultimately the goal is to ensure that residents who live near a given project have access to the jobs it creates. In some cases, geography-based hiring requirements on their own are not enough to ensure that disadvantaged residents are hired. For example, a countywide local hire policy may not be the most effective way to ensure that low-income residents are hired. In such cases, cities can also utilize non-geographic yet targeted hiring measures to direct job opportunities to disadvantaged communities, especially those living in areas of concentrated poverty and unemployment, including people of color, low-income workers, women, and the formerly incarcerated. By combining targeted and local hire strategies, cities can ensure that jobs are directed to residents who need them the most. Local hire policies are one of the most effective strategies for bringing good job opportunities to disadvantaged communities and for ensuring that new investment helps to reduce poverty and unemployment. Communities across the country have turned to local hire measures successfully on a range of projects. Unfortunately, this tactic has not gone unchallenged, both in court and in a few state legislatures. That means community members and elected officials who are looking to bridge the gap and bring opportunities to all residents must not only carefully craft local hire measures, but also ensure that it can be enforced regardless of state-level action. In order to utilize this important strategy successfully, local hire policies must be structured to provide effective guidance to employers, include strong accountability and enforcement measures, and provide for investment in an effective pipeline of targeted workers. Facing uneven development and extremely high rates of poverty and unemployment, especially when compared to the surrounding region, the City of East Palo Alto established the first of its kind local hiring requirement for a major development project in 1996. By 2000, officials passed an ordinance requiring all redevelopment projects that received more than $50,000 from the city to include a local hire component for both construction and permanent jobs resulting from the project. As a result, by 2010, 34 percent of all retail jobs in the city’s redevelopment areas went to residents living in East Palo Alto. Beginning in the mid-2000s, Partnership for Working Families’ (PWF) network of local affiliates developed models and strategies for successfully implementing local hire policies. Starting in cities like Los Angeles and Denver, PWF adapted local hire policies to a range of political environments, projects, and economic climates. Over the course of a decade the policy has become a highly effective method for directing investment to disadvantaged communities by creating effective pathways to high-quality career opportunities. In 2009, Milwaukee officials passed the MORE (Milwaukee Opportunities for Restoring Employment) Ordinance, which extends the city’s Resident Preference Program (RPP) and Emerging Business Enterprise Program (EBE) provisions to private development projects seeking financial assistance from taxpayers. Essentially this ordinance established a set of requirements that developers must meet in order to be considered for development subsidies or assistance. It includes a prevailing wage requirement, as well as increased apprenticeship training and job opportunities for residents of Milwaukee’s poorest neighborhoods. The ordinance also provides a contracting advantage for businesses located in Milwaukee. Outcomes regularly exceeded the targeted hiring requirements so in 2009, with support from the building trades unions and staff of the Department of Public Works, the targeted hiring goal was increased so that 40 percent of all work hours performed on construction projects would go to unemployed or underemployed residents within the city limits of Milwaukee. In an effort to strengthen the program even more, the Common Council voted this summer to expand the program by also targeting residents from impoverished areas of the city. Then in 2012 the Los Angeles Metropolitan Transit Authority (Metro) became the first transit agency in the country to adopt a Construction Careers Policy for construction projects over $2.5 million, including the $2.4 billion Crenshaw/LAX Transit Project, an 8.5-mile light-rail line that runs through the heart of L.A.’s black community. This project was not only important to improve access to public transit for residents of color, but it also represented an opportunity to address elevated poverty and unemployment rates by directing good job opportunities to communities that needed them the most. Building on a decade of successful targeted-hire policies, the Construction Careers Coalition, anchored by PWF affiliate LAANE (Los Angeles Alliance for a New Economy), pushed for a policy that would create pathways for low-income residents and people of color and serve as a template for major infrastructure investments. To this end, the construction careers policy requires that 40 percent of construction hours be performed by construction workers residing in economically disadvantaged areas, 10 percent by disadvantaged workers, and 20 percent by apprentices (already a state requirement. Economically disadvantaged areas are defined as Los Angeles county zip codes that include a census tract in which the median annual household income is less than $40,000. Disadvantaged workers include residents who live in low-income zip codes in Los Angeles County and experience at least two significant barriers to employment, such as homelessness, being a single parent, receiving public assistance, lacking a GED or high school diploma, involvement with the criminal justice system, chronic unemployment, emancipation from the foster care system, or being a veteran of the Iraq or Afghanistan wars. This agreement also included a project labor agreement, which established wage, benefits, and training standards for all workers on the project. To date, 58 percent of work hours on the Crenshaw/LAX Transit Project have been completed by economically disadvantaged workers. More recently, New York City officials adopted local hire policies to respond to the deep economic inequality revealed by Superstorm Sandy. Not only did the 2012 storm result in $19 billion in damage, it also shined a light on deep inequality in the city. Low-income residents, communities of color, and immigrants were hit hardest by the storm and 41 percent of the housing units most impacted were low-income renter-occupied units. In the storm’s wake the Alliance for a Just Rebuilding, including PWF affiliate ALIGN, advocated for a range of policies that would ensure that the communities hit hardest had access to relief spending and that the recovery efforts did not further perpetuate the pre-existing inequality. In addition to a range of housing and environmental remediation demands, the coalition also advocated for and won a 20 percent hiring requirement for Sandy-impacted residents and the first disaster-relief project labor agreement in the country. The alliance also secured funding for pre-apprenticeship and the creation of the Sandy Funding Tracker, which makes comprehensive reporting on recovery job creation and spending available to the public. Despite the positive impacts of local hire policies over the past two decades, these policies have recently been met with resistance in a handful of states, with state legislatures claiming that such policies restrict the pool of workers for contractors, making it harder for them to hire skilled workers and resulting in project delays. In the fall of 2015, Tennessee became the first state in the country to block local hire policies after the state legislature boldly overturned a local hire ballot initiative that had passed in Nashville with overwhelming voter support. Shortly thereafter, Ohio overturned a decade-old policy calling for geographically targeted hire in Cleveland. Fortunately, when Louisiana sought to respond similarly to a New Orleans policy, the community mobilized and was able to defend its local hire program. At the same time, the federal government has recently recognized the value of these policies. Following years of efforts by advocates and local governments, in 2015 the U.S. Department of Labor adopted a pilot program to allow local hiring policies on agency-funded projects, which had been previously prohibited. Despite the recent move by some state legislatures to intervene in local issues and block these programs, local hire remains the most effective strategy for ensuring that economic development delivers good jobs to all community members. More than a decade of experience with such measures in cities across the country has yielded a number of important lessons. Below is a set of principles that enable successful policies and agreements. While these principles hold true in various contexts, it is important to recognize that each effort is unique and addresses different circumstances. Therefore, the application of these principles may vary from case to case. To know when we are successful, we must define success. This is particularly true in a local hire policy. When developing a local hire initiative, target communities must be clearly identified and specific goals should be set. This facilitates the verification of workers from referral and workforce development partners for reporting purposes and ensures that a policy has the greatest impact on addressing inequality and structural barriers to opportunity. Targets can vary greatly from project to project depending on the makeup and needs of the local community. Beneficiaries can be targeted based on economic status (low income, unemployed) or barriers to employment (residency, formerly incarcerated) and subject to important legal parameters like identity (women, people of color) and geography. For example, when Oakland, California, redeveloped a massive former army base into a warehousing and logistics facility, the city required that 50 percent of all construction work hours be performed by local residents and 25 percent of all work hours be performed by disadvantaged residents. The city also included protections against hiring discrimination for job applicants with a conviction history. So far, contractors on the project have exceeded the hiring requirements. State and local laws that restrict or allow hiring requirements also shape targeted hiring policies. Proposition 209 (approved by California voters in 1996) prevents localities from establishing hiring requirements based on ethnicity or gender. Meanwhile, ethnicity- and gender-based hiring requirements are legal in Minnesota. In order for local hire opportunities to become long-term careers, targeted hiring policies should be paired with other measures that ensure that these jobs are well paying and have a career ladder. Labor standards can play an important part by ensuring that the jobs created are decent, family-sustaining positions. But providing good jobs alone is not enough. In order for local hire policies to achieve their goal of bringing career opportunities to those who need them the most, it is essential that there be a plan for finding, screening, training, and supporting workers throughout the process. This career “pipeline” is an essential step in ensuring that community members are able to take advantage of the job opportunities created by local hire measures. A strong “supply side” pipeline for local workers (and employers) that includes outreach, screening, high-quality training, referral, tracking, and support are essential to ensure that community members are able to take advantage of job opportunities covered by the local hiring measures. Such a program should include a centralized referral center and high-quality on-the-job training. Referral centers are community-based organizations and workforce development agencies that function as a clearinghouse for employers and construction union hiring halls, providing them with trained, job-ready applicants. They require dedicated resources to support the outreach and recruitment of workers as well as standardized skills certification. For example, construction careers policies in Los Angeles required the use of a “jobs coordinator,” a third-party entity, to certify and recruit workers on construction projects and to work with a network of construction trade unions, workforce development providers, and first-source referral centers to meet the local hire requirements. In Los Angeles, the Department of Water and Power (LADWP) partnered with IBEW Local 18 to form the Utility Pre-Craft Trainee (UPCT) program. This joint labor-management collaboration has trained more than 200 workers thus far. The pre-apprenticeship program was developed in response to significant challenges facing the nation’s largest municipally owned utility. LADWP faced waves of retirements and the need to transition to cleaner energy sources. Yet it lacked a pipeline of workers for these positions and energy efficiency retrofits were out of reach for many low-income residents. At the same time, many communities in Los Angeles suffered from double-digit unemployment. The creation of the program was supported by RePower LA, a community coalition anchored by the union; south LA-based Strategic Concepts for Organizing and Policy Education (SCOPE); and LAANE. The coalition advocated for the creation of the program, waged a successful campaign to increase investment in the energy efficiency program, and served as a bridge to the utility’s programs, especially for hard-to-reach small businesses and low-income residents. The goals of the RePower LA campaign—uniting quality job creation with improved services for the city’s underserved residents and environmental benefits—fit perfectly with SCOPE’s longtime mission. Over the past 20 years, SCOPE has advanced a series of job creation and workforce campaigns that link low-income communities to growth industries in the region, including energy efficiency and renewable energy. During implementation, SCOPE recruited applicants and made sure they made it on the list for the UPCT program. 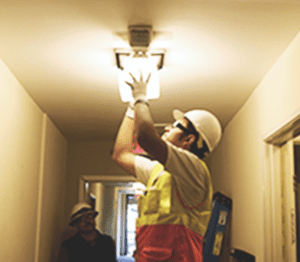 Several SCOPE members joined the program and some found training opportunities connected with energy efficiency outreach work while others benefitted from home upgrades. SCOPE has also leveraged the campaign to develop grassroots leaders. The group organized town halls, career days, community events, and public testimony that caught the attention of decision makers. For local hiring policies to be effectively implemented, it is essential that developers, companies, and elected officials are held accountable to the community. That means creating a formal mechanism through which the community can provide oversight and review. This not only bolsters enforcement and accountability, but also helps build community support for and awareness about the project. Community-based organizations can be important leaders in the monitoring and oversight of project worksites in partnership with labor unions and state and local labor standards offices. Community-based organizations may also support enforcement activities by engaging and educating workers, assisting employees when they need to fill out complaints, and engaging with the labor standards office or independent agency to identify trends in violations to prioritize enforcement. Empowering worker organizations to engage with employees for monitoring, oversight, and enforcement activities are powerful tools to establish equal standing for workers. For example, when Los Angeles incorporated local hire policies into its light rail expansion, the Los Angeles Black Worker Center (LABWC) played a vital role. In the city, black unemployment hovers above 21 percent and is estimated to be significantly higher for black men ages 16 to 25. A total of 30 percent of black workers are paid less than $12 per hour. Median wages in the construction sector are twice this amount, but black communities are vastly underrepresented in the construction sector as well as construction trade union and apprenticeship programs. LABWC’s Community Compliance and Monitoring Program ensures that Metro, the contractor, the subcontractor, and the union comply with the Project Labor Agreement and Targeted Hire Program. LABWC partnered with IBEW Local 11 and SMART Local 105 to develop a community monitoring tool that uses both observational fieldwork and data collection to provide community oversight of the Crenshaw/LAX Transit Project PLA (project labor agreement) and ensure that contractors conduct effective community outreach and comply with the PLA’s hiring goals. Community-based oversight can compliment compliance that should be required by municipal governments to ensure successful implementation and full ownership of the policy by all parties involved. As a result, black participation on the Crenshaw/LAX project reached 20 percent by the winter of 2015, up from no black participation in the spring of 2015. LABWC community monitoring findings demonstrated the effectiveness of PLAs that include community enforcement models. The findings also supported the call for Metro to take additional steps by establishing a public entity to collect data, investigate claims, and partner with other state and federal agencies and community-based organizations to enforce job access and job quality standards among employers who do business in Los Angeles. While it is always important to create a legally defensible and enforceable local hire policy, opposition to the policies at the state level has made it necessary for some states to consider a broader strategy for defending local measures from state intervention. One aspect of this defense is making sure that community members are not only mobilized to pass the initiative, but remain involved in the process and ready to defend the policy. Since Hurricane Katrina devastated New Orleans, there has been some local effort to ensure that redevelopment benefits disadvantaged residents. Through the recently approved Hire NOLA Ordinance, large construction projects are required to have 30 percent local labor, 10 percent of which is coming from disadvantaged groups. Those benchmarks are expected to increase annually over 5 years, culminating with 50 percent local labor, 30 percent of which is performed by disadvantaged workers. Yet shortly after the initiative passed, it faced external opposition. State Sen. Conrad Appel, a Republican from the 9th District, proposed legislation to block local hire. While Appel cited concerns about barriers to nonlocal businesses as his main concern, it is worth noting that whereas New Orleans is 35 percent black and just 53 percent white, Appel’s district is overwhelmingly white (73 percent) and only 10 percent black. Moreover, the median income is $5,000 higher in Appel’s district than in New Orleans. Despite opposition coming from whiter, wealthier districts, the New Orleans community was able to defeat state intervention. Upon learning of the proposal to block local hire, labor and racial justice advocates, community members, and city officials sprang into action by writing to newspapers and the governor and showing up for hearings. The attempt to block local hire was defeated. While the New Orleans case illustrates how communities can mobilize to prevent interference by state legislatures in local policy making, proponents of local hire measures must also ensure that any proposed policy is drafted to survive legal challenge. Partnership for Working Families has a primer on approaches for addressing the most common legal challenges to local hire measures. As these case studies demonstrate, local hire policies can be a powerful tool for combating growing inequality in our cities. If we work to ensure that the fruits of development are shared with those who most need them, smart public investments can not only create new developments and support the growth of our cities, but also create vital job opportunities for people of color, low-income workers, and the formerly incarcerated. If we are able to pursue these goals effectively, all city residents will benefit. Govt at all levels intervenes to advocate & support critical community needs such as job creation; these efforts are manifested via “economic development” projects which are heavily subsidized, for more than 20 yrs. However, govt use the private sector metric of success, which is business development, Chamber of Commerce criteria, rather than socioeconomic criteria as the needed & relevant metric of success. After all, “economic development” is a public term, not a private one, hence, we need to see PUBLIC benefits based upon critical needs, not in market-ready areas as presently done. Govt needs to work more directly with CBOs rather than with the commercial real estate industry, attorneys, bankers, title companies, insurance companies, architects, sales, marketing, etc. as they’ve done for 40 yrs. Let’s use the socioeconomic paradigm by which to measure real “success”, and stop being an extension of the Chamber of Commerce at City Hall. And, instead of relying on “urban” planners who focus on the built environment, use CED practitioners who know the field better than anyone else.